How to Order Custom Hinges –Part 2 – Kielser Machine Inc. 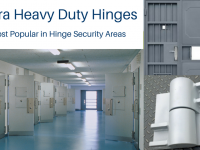 Hinges play a very important role in our daily lives. These hinges can be availed in special dimensions to meet your requirement. In the previous blog, we have discussed preliminary considerations for manufacturing custom hinges. Here we will discuss different customization options available to you while deciding features on your hinges. 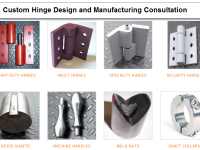 Most hinge manufacturers will provide you customization on the parameters such as specific hinge sizes, materials, and tolerances. Following are some of the other parameters which you can consider while ordering custom hinges. Length: The hinges should always be designed to the length such that it is a multiple of the knuckle length. This helps avoid partial knuckles. Pin Material: All regular hinges are provided with pins and leafs made from the same material. 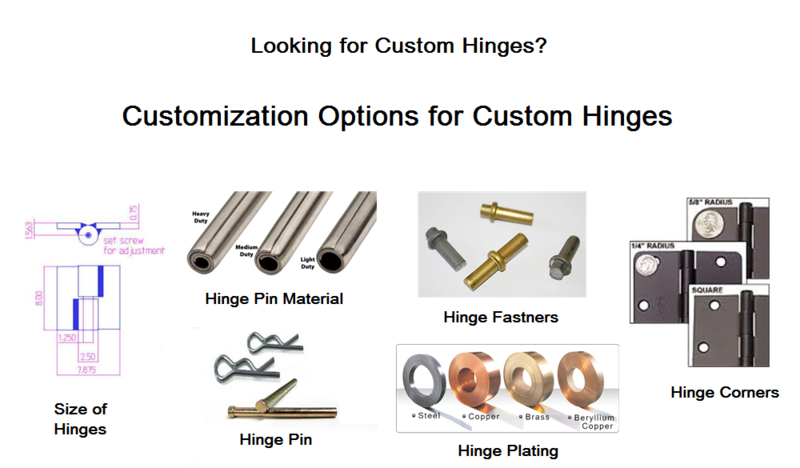 When ordering custom hinges, you can order a pin material different from the leaf material. For example, stainless steel pins with brass pins. Pin Spun Both Ends: This method is used for tamper-proofing or applications which may encounter severe vibrations. Flush Pin Stacked: This is the most popular way of retaining the pin by stacking it on the backside or topside of the knuckle. Piercing: Custom hinge manufacturers may provide you several designs for piercing. While requesting a quotation always make sure that you include the hole diameter, hinge dimensions, hole centers, end and edge dimensions. Fasteners: You can request hinges with self-piercing fasteners, if required. Plating: You can avail a variety of plating finishes on request. Some of the common ones include cadmium, anodized (gold, satin, black, and bronze), painted or pre-painted, zinc (black, yellow, and clear), and nickel and brass. Shear Both Leaves Evenly: Both leaves of the hinge are sheared evenly for equalizing their widths. Shear Both Leaves Unevenly: While most standard hinges are provided with two leaves of the same width, some manufacturers can shear both or one leaf to any size. Shear One Leaf: One leaf will be sheared, whereas the other will remain untouched as per your requirement. This may help you fit the hinge to any surface you require. Loaded to Open Springs: These springs can be added to a hinge to push the leaves apart. Loaded to Close: These springs can be added to hinge to push the leaves together. Multiple Springs: These include a wide variety of torsion springs that can be added to the hinges. Corners: Most hinges provided with clipped leaf corners, or standard round corners. Clipped leaf corners are preferred for their aesthetic appeal. These corners help reduce the sharpness of the edges so that they don’t prick and scratch anyone. The clipped corners are usually defined with the angle of clipping. You can check if the manufacturer can provide them in specific angles. Radius corners have smoother edges than clipped leaf corners. You can always mention the diameter of the radiused corners for a better product. 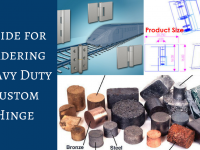 Most manufacturers will ask you to send your specifications, diagrams, or samples before the start of your project. You should also mention applications of the springs to ensure that the final product is able to meet your application requirements. 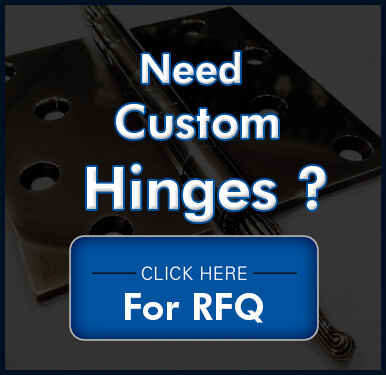 We believe the above information will help you make appropriate decisions regarding custom hinges. If you are still skeptical about your choices, it is always better to check with the manufacturer or approach an industry expert.